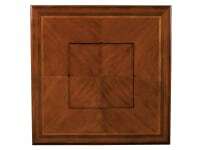 42" x 42" x 31.5"
Maple, Walnut & Cherry Inlays. 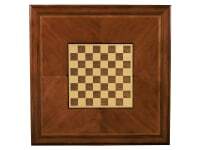 Removable Inset top Has Cherry Veneer On One Side and Chess/Checkers On The Other Side. 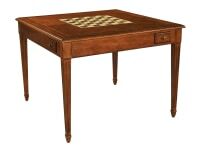 A Backgammon Board Is Stored Under The Removable top Along with Game Pieces, Which Are Not Included. (W x D x H): 42" x 42" x 31.5"